Located in Santa Fe County, New Mexico, the friendly community of Pojoaque is an excellent place to call home. Neighboring the Pojoaque Pueblo, a Native American reservation, this community offers an excellent location, beautiful scenery, fantastic single-family homes and condos, and much more. Regardless of your interests, you will not struggle to find enjoyable activities to fill your free time when you choose to live in this area. Whether you are interested in nature or metropolitan life, you are certain to discover activities that will complement your favorite pastimes. Homes for sale in Pojoaque are ready to impress you, so now is the time to consider what it would be like to call this area home. As a resident of this area, you will have easy access to plentiful entertainment opportunities. For example, if you like spending time outdoors, then you will appreciate the proximity of pleasant parks and natural areas. Envision invigorating hikes, exhilarating bike rides, relaxing strolls, and picnic lunches with wonderful views. These attractions can become part of your everyday life when you live in Pojoaque. If you are ready for a more metropolitan adventure after spending time in nature soaking in the sunshine, you will not need to look any further than nearby Santa Fe. This dynamic city will provide you with opportunities to tour interesting museums, explore impressive art galleries, attend captivating live performances, and take part in fun local festivals. You may also choose to explore the city’s railroad history, shop in eclectic boutiques, browse the farmers market, and much more. No matter where your adventures lead you, you will be content to think of you Pojoaque single-family home or condo awaiting your return. Wonderful neighbors, beautiful residences, a convenient location, ample entertainment opportunities, and lovely scenery are only a small sampling of what you will appreciate about living in this area. Available properties in Pojoaque are ready to pique your interest, and you are sure to find something that suits your style. 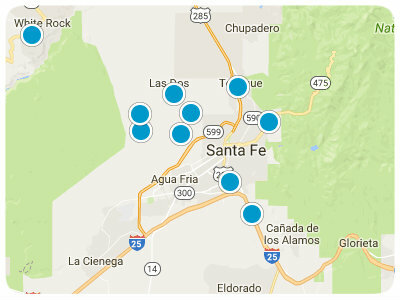 If you are ready for more information regarding Pojoaque, Santa Fe, real estate options, please do not hesitate to contact us. Come and see this 2,000 SF adobe home with guest house! This is a great fixer upper project! Property is zoned both commercial and residential. Great location!